During the holidaze one of my most favorite activities is switching on the TV and running smack into the beginning of one of the Lifetime for Women holiday movies. My favorites are the scenarios that include a brittle professional woman who has no time for a relationship, is super busy; and then she bonks her head on Christmas Eve and wakes up to find she has a husband and a couple of children. She spends a third of the movie acting funny and trying to go back to her old life, but she finds again and again that life is gone, baby gone. And then at the end of the movie she realizes she likes her new life and is happy and content. These movies include really cool kids and a really dreamy husband. Lots of flannel and big mugs of hot cocoa or coffee and pretty fake snow that get stuck in the actress’s hair during one of her many freak-outs. These movies include a lot of jumping out of windows or running down the driveway to escape. If it wasn’t on Lifetime these scenes would be straight out of a Ira Levin novel (author of The Stepford Wives and Rosemary’s Baby). But it isn’t – so it’s funny. What does this network really want women to feel? Mostly fear. It should be called Lifetime: A Channel to Scare Women. Still this network is a guilty pleasure of mine. Lifetime has given us their spin, albeit a little skewed with women having to marry and have children to bring true happiness. But, why isn’t the other way around? A woman who is a wife and mother gets bonked on the head and finds herself leading a Fortune 500 company and is really happy and secure. Sure she looks for those kids and her husband for a third of the movie, but at the end realizes, at the helm of her yacht in Barbados, that it is really good to be at the top, alone and rich. Oh, I get the Lifetime movies. We tend to wax nostalgic at the end of a year and so we re-evaluate and reconsider choices and then at the end of the bottle of wine or carton of cigarettes or journaling or whatever you do when you wax nostalgic – you realize your life is good and you are happy. Or you realize the opposite. Yikes! 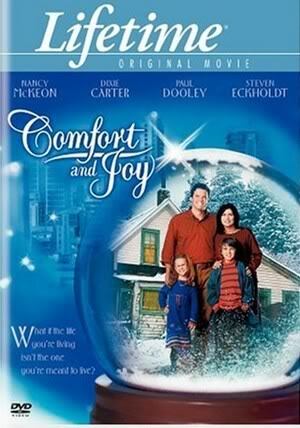 Please check out Nancy McKeon in Comfort and Joy (2003). It is exemplary for this theme. And it has Nancy McKeon! Jo from Facts of Life! I watched this movie on Lifetime last year because Jo is the First Lady of Lifetime. The Tracey Thurman Story? I can’t NOT watch it if it’s on. Love her. I remember your disappointment in the other post about Lifetime movies and omitting Nancy McKeon from my lineup and only conetrating on Melissa Gilbert. So, I thought I would have to do justice to the Queen!